Finished: Electrostatic powder coated paint. The Optronics Wall Mount Fiber Distribution Unit provides a convenient way to connect a number of fiber optic cables in a wall or specific spot when managing fiber networks. 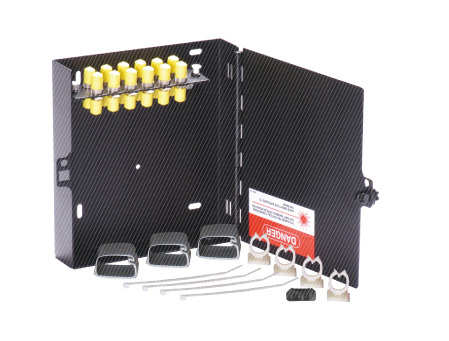 Its cover allows a 180° opening to ease the cable management, as well as to protect the splices. The Optronics Wall Mount Fiber Distribution Unit contains 1 modular panel which can be custom ordered configured, together with the accessories needed to manage and identify the fibers and reduce installation times.